Sally's Sea of Songs: TpT Site-Wide SALE! 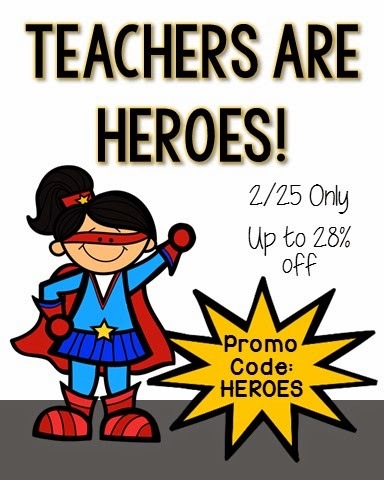 The "Teachers are Heroes" Sale will be held on February 25. My store will be 20% off during the sale. If you enter the promo code HEROES during the check-out process, TpT will add on an additional discount for a total of 28%. This is great savings on great music resources! Another tip for you: Take a few minutes and leave some great feedback on all of your recent purchases. TpT will give you $1 credit for every $20 in purchase feedback that you leave. More savings for you! I appreciate your support of my store!